Zuktamrurite, FeP2, is a new mineral, a natural iron diphosphide found in the pyrometamorphic rocks of the Hatrurim Formation, in the southern part of the Negev Desert, Israel and on the Transjordan Plateau, Jordan. The mineral occurs as irregular grains up to 50 µm in size associated with murashkoite, FeP, and barringerite, (Fe,Ni)2P. In reflected light, zuktamrurite is white with a distinct bluish tint. It is non-pleochroic but exhibits distinct anisotropy in bluish colours. Reflectance values for the IMA COM recommended wavelengths are [Rmax/Rmin, % (λ, nm)]: 50.40/47.20 (470); 49.16/46.23 (546); 48.97/46.16 (589); 49.40/46.40 (650). It is brittle. Electron microprobe analysis of the holotype specimen gave the following chemical composition (wt%, average of 5 points): Fe 40.23; Ni 7.97; P 51.70; total 99.90. The empirical formula calculated on the basis of 3 apfu is (Fe0.86Ni0.16)1.02P1.98 corresponding to FeP2. Zuktamrurite is orthorhombic, space group Pnnm, unit cell parameters refined from the single-crystal data: a 4.9276(6), b 5.6460(7), c 2.8174(4) Å, V 78.38(1) Å3, Z = 2. Dx = 5.003 g cm−3. The crystal structure was solved and refined to R1 = 0.0121 on the basis of 109 unique reflections with I > 2σ(I). The strongest lines of the powder X-ray diffraction pattern [(d, Å) (I, %) (hkl)]: 3.714 (54) (110); 2.820 (31) (020); 2.451 (100) (120, 101); 2.242 (55) (111); 1.760 (37) (211). The mineral is named for the Zuk-Tamrur cliff (Dead Sea) located nearby the type locality, the Halamish Wadi, southern Negev Desert, Israel. Zuktamrurite is the phosphide analogue of löllingite (loellingite), FeAs2. It is the most phosphorus-rich phosphide ever found in nature. The online version of this article ( https://doi.org/10.1007/s00269-018-1008-4) contains supplementary material, which is available to authorized users. This research was supported by the Russian Science Foundation (Grant 18-17-00079). 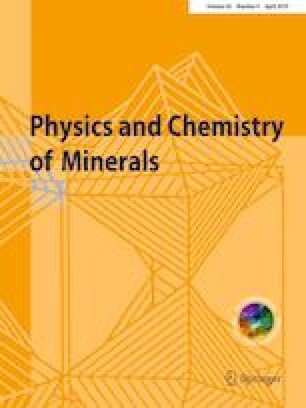 The authors thank X-ray Diffraction Centre and “Geomodel” Resource Centre of Saint-Petersburg State University for providing instrumental and computational resources. The authors gratefully acknowledge Dr. Chris Stanley and the anonymous reviewer for the helpful comments.